They floated clinically anxious and depressed people once each and measured their anxiety state shortly before and after floating. That is, people who had an anxiety-related diagnosis from a psychiatrist, like Generalized Anxiety Disorder, Social Anxiety Disorder, Panic Disorder, Agoraphobia, and/or PTSD. The paper says nothing about why the changes happen, or how long the effects might last for, or how often one “should” float. 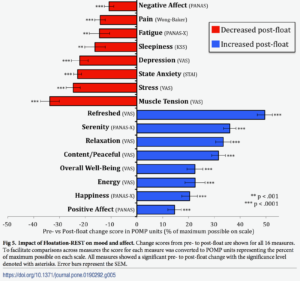 Negative mood and affect decreased post-float, and positive mood and affect increased. And here’s an article that might be helpful… How to read and understand a scientific paper: a guide for non-scientists. We’ll be returning to this study, as there’s much more there to share. 60 pages of there, in fact. Stay with us!